Lisa Rappaport seemed to have it all--a popular boyfriend, a wealthy father, and a sudden and unexplained case of amnesia. A late-night phone call brings psychic Denton Ward and his girlfriend, Private Investigator Monty Crocetti to her bedside and into her life. Her doctor thinks it's a routine case, but a hypnosis session with Denton brings to light a possible cause for her memory loss--alien abduction. Lisa swears she is a virgin, but a drugstore test proves she's pregnant. Could the father be of unknown origin? Or is the answer here on planet Earth? 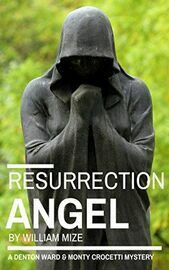 Resurrection Angel was chosen by noted mystery editor, author and critic Robert Randisi as a finalist for the St. Martin's Press - Private Eye Writers of America Best First Novel Contest. It was also nominated for the Private Eye Writers of America's Shamus Award for Best First Novel of the Year, the first Print on Demand book to ever be nominated for a major mystery writing award.